Magerealm_The Easter Carnival is in Town! 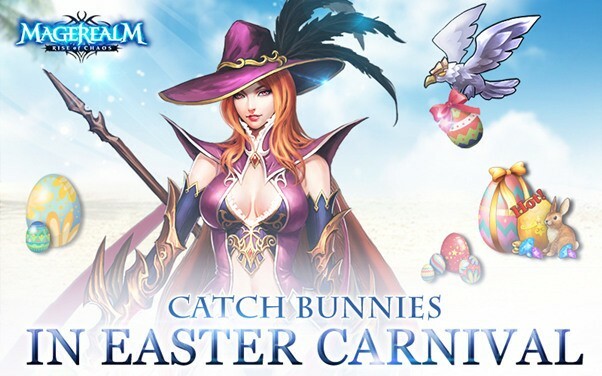 Easter is here and Magerealm has a special carnival prepared just for you! And of course you can’t hold an Easter Carnival without the traditional Easter Egg hunt. Try the new Easter minigames and win all kinds of cool rewards! The first game is the Easter Egg hunt! Test your memory and see if your eyes can keep up with the elusive Easter Bunny as he tries to hide his eggs! The Easter Bunny will hide behind 1 of 4 cards. Players must guess where the Easter Bunny is hiding after the cards have been shuffled. Find the Easter Bunny and he will reward you a random Easter Egg (4 different qualities). Players can have up to 4 Easter Eggs at a time. Players will also extra rewards just by playing. When players reach specific amounts of total games played, they can claim special participation rewards! The Easter Eggs obtained during the Easter Egg Hunt will show here (up to 4). Players can choose 1 egg at a time to smash. Selecting an egg will start a timer. Once the timer reaches 0, players can smash open that egg to see what goodies are inside. The quality of the egg will determine what random rewards you get. Players can get “Easter Tokens” from smashing eggs. There are 4 types of Easter tokens: Waxy Candle, Dark Chocolate, Bunny Doll, and Flower Bouquet. Tokens can be exchanged for a variety of great Easter Chest rewards in the special Easter Token Exchange shop. The more you exchange, the greater the rewards! Grab your egg baskets and hunt down those bright and colorful rewards!